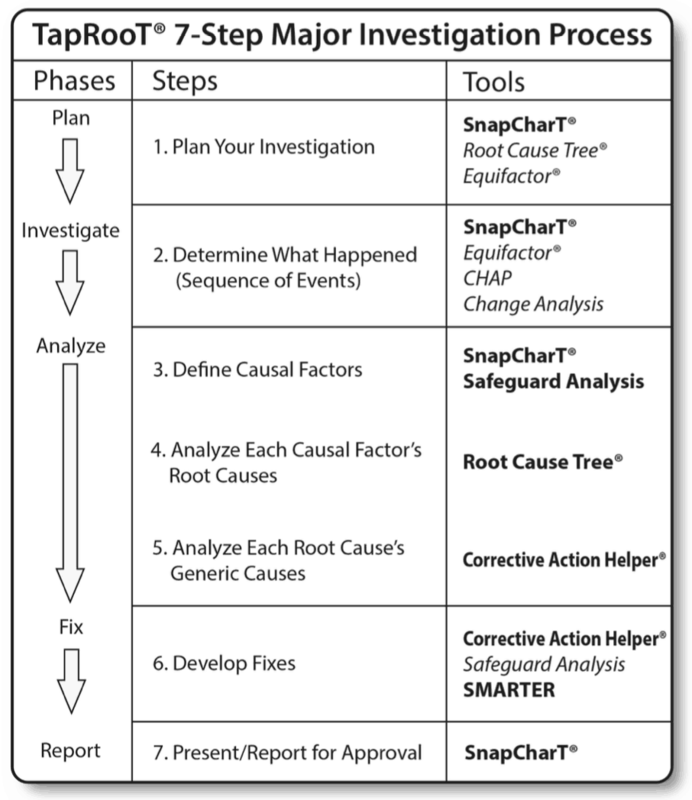 What is TapRooT® Root Cause Analysis all about and how does it help client companies? Watch this 21st Century Business TV segment for more information. For over 30 years, we've developed and improved a powerful root cause analysis system supported by effective training and the patented TapRooT® Software. Industry leaders use the TapRooT® System to improve safety, human performance, equipment reliability, and quality by investigating precursor incidents before major accidents happen. Collect, understand, and organize evidence about what happened. The TapRooT® tool, the SnapCharT® diagram, reduces investigator bias and makes the facts make sense without developing hypotheses. Identify all the Causal Factors (the human errors or equipment failures) that led to the problem – the starting point for root cause analysis. Use expert guidance to analyze human errors using the Human Performance Troubleshooting Guide and equipment failures using the Equifactor® Troubleshooting Tables. Analyze the real root causes of problems guided by the Root Cause Tree® Diagram and Dictionary. Develop effective fixes for problems using the The Corrective Action Helper® Guide and Safeguard Analysis to stop repeat incidents or significantly reduce their consequences. 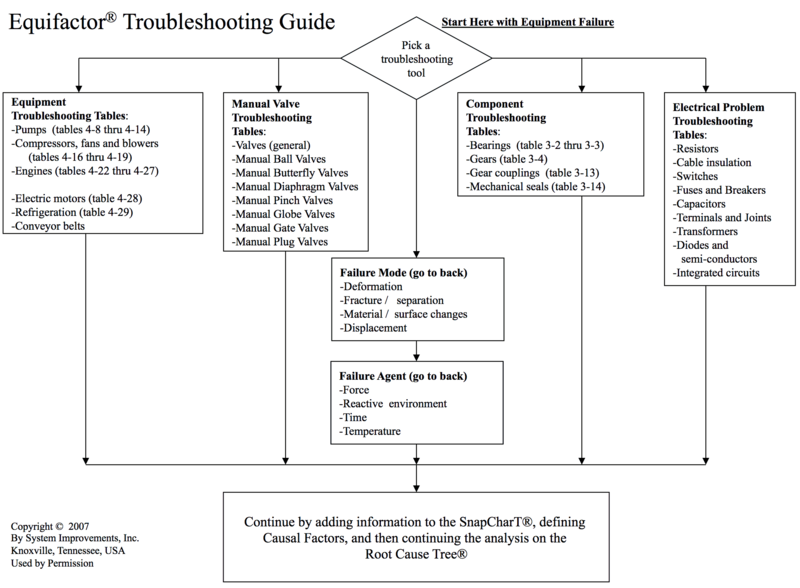 All of the essential TapRooT® techniques: SnapCharT®, the Root Cause Tree® and Dictionary, Safeguard Analysis, and the Corrective Action Helper® Guide. The optional TapRooT® techniques: Equifactor®, Critical Human Action Profile (CHAP), and Change Analysis. Customizable reports that the investigator can use to confidently provide presentations or written management reports. The ability to trend incident and root cause data. The TapRooT® System is a tested, documented, root cause analysis process that is used around the world. Early on we understood that no matter how good the process is, we had to develop world-class training to teach people to stop the bad habits of placing blame and jumping to conclusion and demonstrate the new ways to understand and fix problems using TapRooT®. We start with the 2-Day TapRooT® Root Cause Analysis Course for people who will be investigating low-to-moderate risk incidents (precursor incidents) using the essential TapRooT® Techniques. For those that will investigate both precursor incidents and major accidents, we developed the 5-Day Advanced Root Cause Analysis Team Leader Training that includes both the essential and the optional TapRooT® Techniques and instruction on interviewing, information collection, and human performance improvement. For those mainly interested in equipment reliability, we developed the 2-Day Equifactor® Equipment Troubleshooting and TapRooT® Root Cause Analysis Course. This course can be shortened to one day to teach just the troubleshooting techniques to technicians who will apply them every day in the field. Beyond our standard courses, we have specialty courses on root cause analysis for auditing, trending, human performance improvement, healthcare sentinel event investigation, interviewing and evidence collection, and risk management. These courses are offered prior to our annual Global TapRooT® Summit. All of our training can be provided at your site or see our public courses list here. This technique is used to find and fix problems associated with low to medium risk incidents. Step 1: Find out what happened. You must find out what happened before you can find out why it happened. This step helps investigators collect, organize and analyze what happened. Step 2: Decide if there is more to learn. With an understanding of what happened, you are ready to decide if there is more to learn by applying the rest of the essential TapRooT® Tools. If not, the incident is recorded and the investigation is closed. If there is more to learn, the investigator proceeds to Step 3. 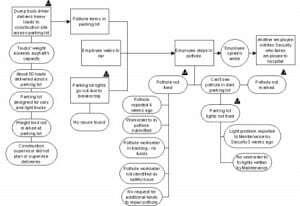 Step 3: Find Causal Factors using Safeguard Analysis. Dig more deeply and use Safeguard Analysis to pinpoint all the human errors and equipment failures that contributed to the incident. 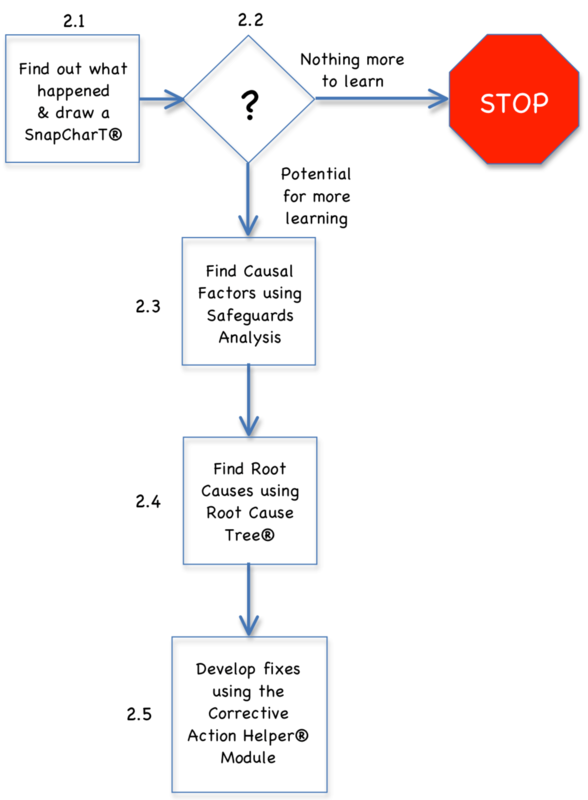 Step 4: Find root causes using the Root Cause Tree®. Each Causal Factor is analyzed to find its root causes. Note that incidents almost always have multiple Causal Factors and root causes. Fixes (corrective actions) are developed and implemented using an expert system – the Corrective Action Helper® Guide/Module. Even in the best run companies, there is a remote chance of a major plant upset/equipment failure, a major quality issue, a serious injury or fatality, or a significant environmental release. If this happens, the best companies are ready to find and fix the real root causes of the problem. A more detailed 7-step process is used that includes both the essential TapRooT® Tools and the optional ones. In addition, investigators look for the generic (systemic) causes to try to prevent whole classes of future incidents. Step 1: Plan your investigation. Assess what you know, assemble your investigation team, preserve easily lost evidence, decide who to interview, and address any immediate safety issues for your investigation team. Step 2: Find out what happened. You must find out what happened before you can figure out why it happened. Use your SnapCharT® to document and organize the information you collect. Equifactor®, Change Analysis, and CHAP are used to dig deeper into tough to understand issues. Safeguard Analysis is used to pinpoint the human errors and equipment failures that led to the incident. This is the start of finding the root causes. Step 4: Analyze each Causal Factor’s Root Causes. Causal Factors are analyzed for root causes. Every major accident has multiple Causal Factors and multiple root causes. Step 5: Analyze each Root Cause’s Generic Causes. Investigators go beyond root causes to identify systemic/programmatic causes that, when fixed, can eliminate whole classes of incidents. Fixes (corrective actions) are developed and implemented using TapRooT® Tools and an expert system. Then each fix is evaluated using the SMARTER technique. Step 7: Present/report for approval. Present your investigation and findings to management orally and/or in writing. Your presentation SnapCharT® is an effective tool to communicate what happened and why it happened to management so that they can understand the proposed fixes and fully support the changes with the resources that are needed. Start improving your processes today. Why Do Industry Leaders Recommend TapRooT® Root Cause Analysis? 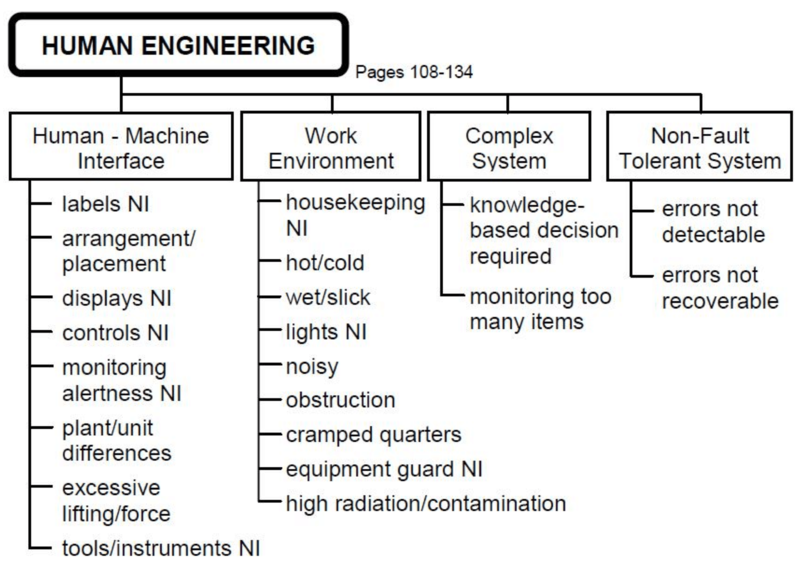 A systematic process based on over 30 years of in-depth human factors and equipment reliability research. Designed to keep investigators out of common investigation traps including the blame game and jumping to conclusions. Tested by government agencies and industrial leaders around the world, and continuously improved to produce reliable, repeatable, explainable results. Not just a root cause analysis system, but a complete investigation process that helps investigators collect the information they need to find root causes and develop effective corrective actions. An expert system that leads investigators beyond their current knowledge, and makes them feel like they have a human factors expert sitting beside them when analyzing human errors. The patented TapRooT® Software (either Hosted or On-Premise) can make the system more efficient, and to allow sharing and trending of investigation results. Targeted training for those who will just investigate precursor (simple) incidents, equipment failures, or major accidents. Copyrighted, proprietary Root Cause Tree® and Dictionary, and Corrective Action Helper® Guide are developed by our expert staff. They have been continuously improved for over 30 years. The TapRooT® Advisory Board of over 60 industry and governmental leaders from around the world to provide improvement ideas and critique planned improvements. Equifactor® troubleshooting tables designed by equipment expert Heinz Bloch. Extensive, readable documentation. The best selling TapRooT® series of books has sold well over 100,000 copies around the world. A worldwide network of experienced instructors/facilitators with extensive real world experience. This helps them answer tough questions in TapRooT® Courses and provide expert assistance when facilitating difficult investigations. A global user network and a discussion site on LinkedIn. With over 10,000 people per year being trained to use TapRooT®, you can be assured that there is someone who has faced challenges similar to yours, and solved them using TapRooT®. A free, weekly eNewsletter to promote continued learning of advanced root cause analysis, equipment troubleshooting, and performance improvement. A YouTube video channel where users can learn the latest root cause and investigation tips. A weekly TapRooT® TV lunch and learn hosted on Facebook to continue the learning process. An annual, Global TapRooT® Summit to promote networking, benchmarking, and learning of advanced best practices and the most recent performance improvement technology. Attend TapRooT® Training. Go back to work and apply what you have learned to investigate incidents, accidents, quality problems, or other issues. If you don’t find root causes that you previously would have overlooked and if you AND your management team don’t agree that the corrective actions you recommend are much more effective, just return your course materials and we will refund the entire course fee. With a guarantee that straightforward, you can be assured that you won’t be wasting your time. Understand what happened to decide what to do next. Identify problems that contributed to the incident. Equifactor® was designed with the help of equipment reliability expert Heinz Bloch. Equipment failure analysis and reliability professionals, engineers, equipment reliability specialists, maintenance supervisors, mechanics, maintenance supervisors, and others who analyze equipment problems find the Equifactor® Troubleshooting Tables to be extremely useful when performing a systematic analysis of the reasons for an equipment failure. The Root Cause Tree® is the secret sauce in the TapRooT® System. Initially developed by Mark Paradies, David Busch, and Linda Unger to help people perform better root cause analysis of human performance and equipment reliability problems. Uses the latest human performance and equipment reliability technology to help investigators in the field find root causes. Extensive development history including testing in many industries and feedback from users around the world. Includes a 15-question expert system (The Human Performance Troubleshooting Guide) to guide investigations of human performance problems. Seven basic cause categories all meticulously described in the Root Cause Tree® Dictionary. The guidance helps investigators thoroughly analyze the causes of human error and, using the Corrective Action Helper® Guide/Module, develop effective fixes to stop, or significantly reduce the consequences of, human error. TapRooT® offers a wide range of training to support incident investigators including root cause analysis, equipment troubleshooting, evidence collection and interviewing, trending, proactive use of TapRooT® (auditing) and software.